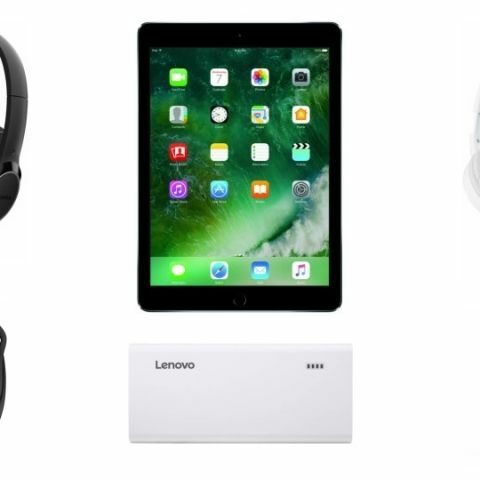 Today we have rounded up some of the best available deals on headphones, smartphones and their accessories, and more. Looking for a fitness band, or a smartwatch which doubles as one? Well, we have listed both in our today’s deals story, along with some other gadgets, which are currently being offered at a discounted price. The Apple Watch Series 1 smartwatch with a 42mm strap is on sale after being discounted by 20 percent. It comes with a heart rate sensor, accelerometer and gyroscope. The watch sports a 1.65-inch OLED retina display with 312 x 390 Pixels resolution and supports calls, Bluetooth and WiFi. You can buy the device here. The water resistant Mi Fitness Band features Bluetooth 4.0 connectivity and it comes with sleep-cycle smart alarm, fitness monitor and sleep tracker, and boasts of up to 30 days of battery life. You can buy it here. The 32GB Apple iPad features a 9.7-inch screen with a 2048 x 1536 Pixels resolution. It is WiFi enabled and claims of delivering up to 10 hours of battery life. You can buy it here. The Moto E4 Plus is powered by the MediaTek MTK6737 1.3GHz Processor with 3GB RAM and 32GB of internal storage. It features a 5.5-inch HD display and comes with a 13MP rear sensor and a 5MP front-facing camera. You can buy the device here. The 1040 mAh Lenovo power bank features two USB ports and is capable of simultaneously charge two smartphones at once. It boasts a power output of 5V/2.1A and 5V/1A. You can buy the device here. The Sony headphone come with high energy neodymium magnets and sport 30mm dynamic driver units. It features an over the ear design and can be folded as well. You can buy the headphone here. The SteelSeries Siberia P100 headset feature over the head design and come with 2 years warranty. It features a min frequency response of 20 Hz and max frequency response of 20000 Hz. You can buy the device here.